You need to get rid of piles of junk items, rubbish and other useless objects in your house? You just found the right company to contact for help! 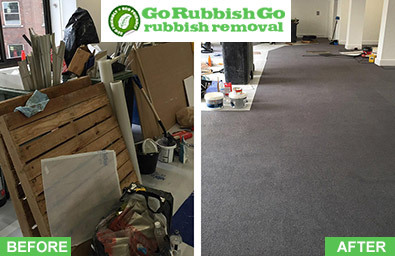 We at Go Rubbish Go specialise in that area, which for most people is disgusting or they don’t like to spend time dealing with dust, dirt and junk. There is no need to struggle. With our professional Bow house clearance services, we deliver the best clearance solutions even for the darkest basement, cellar or loft in your house. We do it professionally and our crew of experts can save you a lot of time and troubles. They know where to start from and how to achieve the desired result. So, you only have to tell us your expectations and the desired result after the house clearance E3. Call us on 020 8610 9182 today. The only better thing than a professionally de-cluttered house is a low-cost house clearance E3 service. We offer that one too! Our services have the lowest prices in the area and all that comes with a high quality of service. It may sound like a fairytale, but you can easily check that out by talking to our experts on 020 8610 9182 and asking them about our seasonal discounts and our special promotions for local or regular clients. Furthermore, we save you time, because we know that dealing with big, heavy and dirty waste objects all by yourself is not the fastest option. We have the right tools and methods to get the job done efficiently and quickly, so you don’t have to spend more on your house clearance Bow. Thanks to the knowledge and skills of our men in a variety of Bow house clearance tasks, we can help you get rid of the rubbish in just about every place in your house. Some special places require special methods and equipment, but we have it all. From lofts where the steep and narrow stairs are an issue, to garages or sheds where the mould and spider webs are everywhere – we can take care of those too. There are many specific issues you could come across during the Bow E3 house clearance, but there is no doubt we can handle them professionally and quickly. The right spots for sorting the different type of rubbish, the places for collecting the rubbish in order to avoid extra distance and yet to keep the environment safe, the legal requirements for disposal of rubbish – our crew has answers to all of these specific questions. Our numerous years of experience have helped us to develop unique skills for dealing with every type of junk, so there is no need to worry if you have a huge old boiler rusting in the basement or a large sofa taking up space in your loft. House clearance E3 is what we excel at, so let us show you our skill, no matter what the waste. Usually, there are issues with space in the densely populated Central London area, but we can solve most of them via our special tools, such as ladders and heavy lifting tools. We have our own pick-up vans, which are properly equipped to provide the highest level of environmental and public safety. House clearance Bow can be so easy with our team! Before getting started with the Bow house clearance E3, ask yourself “why recycle”. It’s a common question that is always on the agenda, because recycling is the easiest method for reducing the amount of rubbish ending up in tips. However, recycling is not always the simplest method. It requires thorough sorting of all the rubbish by type, because some objects can be recycled and others can’t. Some objects have to be separated and disposed for recycling in different treatment facilities, while other centres provide recycling services for a variety of types of waste objects. Our services are the best choice to reduce the amount of junk after your E3 house clearance as we will send everything that can be recycled for recycling. 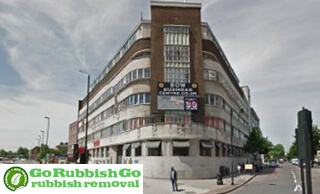 What Makes Us the Best House Clearance Company in All of Bow? A number of advantages set us apart from all the E3 house clearance services in and around, and our exceptional professionalism play a key part in that. We provide exactly the services that we promise – nothing more and nothing less. We know that time is essential for you and we can deal with road traffic, as well as narrow and crowded streets with sharp turns. Our Bow house clearance crew always arrives on time and can finish the job within a few hours. 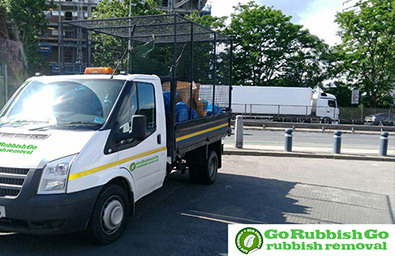 We pay great attention to detail and we can act immediately – call us on 020 8610 9182 and book your appointment now for swift and efficient help with your rubbish. Bow is part of the London Borough of Tower Hamlets and is known for being ethnically and culturally diverse. The area is also rich in history and still has a lot of its original architecture from centuries ago. Situated in East London, it is not far from Old Ford, Leyton and the Blackwall Tunnel. It is also near Mile End, Stratford and Bromley-by-Bow. Victoria Park and Mile End Park are also within walking distance. You can reach the area via Bow Road tube station, which is on the District and Hammersmith and City lines. Bus links to this area are good too.